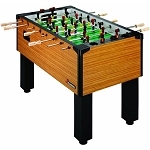 Foosball Table - Atomic G03850W AS1 Soccer Game Table. 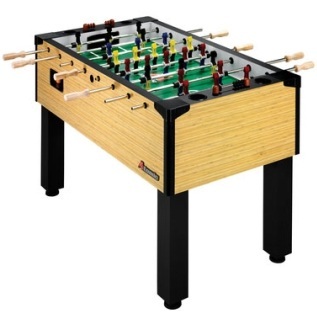 Free shipping to the lower 48 United States for this Foosball Soccer Game Table. Atomic Foosball game tables feature a bamboo color finish on the table sides and wide-foot player design. The frame and playing material used for this soccer game table are made with MDF board. Escalade Sports warranties this soccer game table for 3 years. Leg and table material of construction: MDF board. Players features a wide-leg design to help limit dead spots on the board. Table top has recessed cup holders. Sure-foot leg levelers built-in to each foot. 3 inch diameter rubber feet. Player rods made of steel. Hardwood handles resist warping over time. Handles have octagonal shape for easy gripping. Rubber bumpers absorb impact of rods moving in and out. Traditional wood abacus helps tally the score. Comes with 3 orange foosball balls. Comes with a 3 year warranty from Escalade Sports. Table shipping weight: 303 lbs. Soccer table shipping dimensions: 92.50 inches L x 50.50 inches W x 12.50 inches H.
Game table assembled weight: 240 lbs. Game table assembled dimensions: 56 inches L x 31 inches W x 36 inches H.
Playing surface weight: 3/4 inch. Cabinet dimension: 15 inches x 2 inches. Legs are 4 inches square. Feet dimensions: 3 inches diameter. Player rod dimensions: 0.125 inch diameter. Ships from warehouse in Evansville, IN. Ships via a curbside delivery through an LTL freight carrier. This type of delivery means the customer must be present to sign for the delivery, and help unload the product. Delivery times for residential deliveries scheduled before delivery. Dimensions: 93" x 51" x 13"